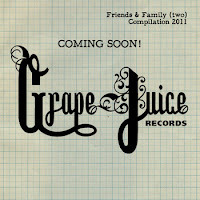 The crew at Grape Juice Records have an early Christmas present for you. 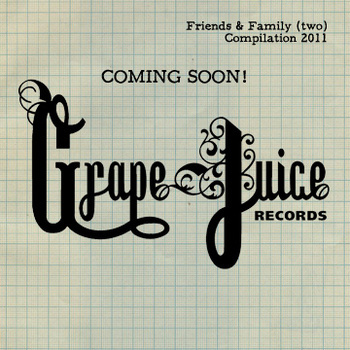 Today the Chicago label has released a free 11-track music sampler titled Friends & Family II, the second of their annual compilations showcasing artists they have worked with over the past year. Included are some really great locally-based musicians such as Derek Nelson & the Musicians, Jon Drake & the Shakes, Rachele Eve, The Shams Band and many more. Check out the full track listing below and download the compilation on GJR's Bandcamp site. 1. Jon Drake & the Shakes - "Margie"
2. Julie Meckler - "Deportation Blues"
3. Will Phalen - "Candycane Mountain in My Mind"
4. Rachele Eve - "Pronouncing Logic"
5. Musikanto - "To See You One More Time"
7. Curtis Evans & Our Friend Electric - "Mark of the Beast"
8. Derek Nelson & the Musicians - "Come and Wait"
9. No Ordinary Oswald - "40 Watt Womb"
10. The Minneapolis Henrys - "Where My Mind's Been"
11. The Shams Band - "In the Sun"